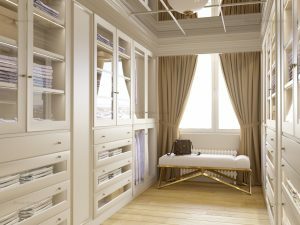 Custom made traditional closet are being made-to-measure to fit the shape of the room. Traditional wardrobes remain popular for its ageless and timeless beauty that can easily integrate with any design theme of the house. Moreover, shaker style closet can even be a part of the modern home interior. Custom-made shaker-style wardrobe are popular because of the natural beauty and elegance. The simple and straightforward look of the closet provides it an ageless and classical appeal. With the modern trend towards minimalism, custom-made shaker-style wardrobes have become one of the most sought after styles because of its sleek look that easily integrates with any theme of the house. Bespoke spray-painted wardrobes are traditional closets that with the power of paint improve the beauty of the unit. The variety of designs and colour you can choose from gives you an opportunity to create a unique design feature that can either seamlessly integrate into the space or become a centrepiece of the room. Comparing to the hand-painted option, spraying paint is the best way to colour the wardrobe to ensure that the whole bespoke wardrobe is completely coated evenly and quickly. Apart from choosing the tone of the closet, there also be a choice of matt, standard or high gloss paints.